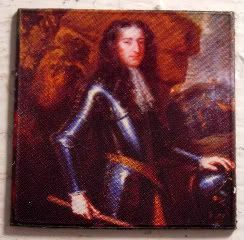 Won't lie, I don't even want to cover all of the meaning of William III on the throne, but my photobucket bin of readily available magnets will start wearing pretty thin while I'm here in NC unexpectedly. Ya'll know what I'll never understand? Titles. Like, I never really understood them in the corporate world - how some people vy for better titles, versus having a better salary, or why some people think that whatever's after the comma defines you as a person somehow. I guess we're all a little guilty of it at some point or another. But I think it might be worse for the royals, since you know, from birth, they come with these humongous titles that mean something on some paper somewhere, and oh, by the way have whole countries of people depending on them. Take William III. His father, William II, died of smallpox eight days before Tripp was born, making Tripp Sovereign Prince of Orange directly from birth. Seriously. He came out of the womb, and bam! he was head of the Principality of Orange in Southern France. I mean, he was born in The Hague in the Dutch Republic, and responsible for something along the Rhone! Which brings me to the other thing that always baffles me when I think about it. The royal network across Europe, how they end up ruling bits and pieces of other countries throughout Europe. Oh, I know they marry into it, they're appointed, they conquer it, they're born into it, whatever, but it always makes me laugh when I see or hear it in the movies...oh, and by the way, I may be King of England, but that bit of France, that bit of Holland, and maybe some of that bit in North America and Australia, and maybe a bit of Mars and Venus, are mine, too. So, William III of *that* William and Mary ended up in the end, "By the Grace of God, King and Queen of England, Scotland, France and Ireland, Stadholther of the Republic of the 7 United Netherlands, Prince of Orange, Count of Nassau, Defenders of the Faith, etc." First, what's the "etc" stand for? Second, how'd he put all that on a business card?